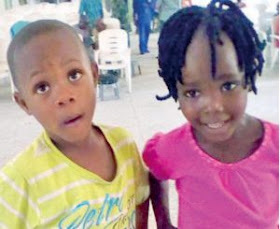 Five-Year-Old Erikan Emmanuel Edu, female, and Emmanuel Edu Jnr, male, are a set of twins born three months apart from different wombs of the same mother, their father, Bishop Emmanuel Edu, the presiding Bishop of United Pentecostal Church, Utu Abak Road, Abak Local Government Council in Akwa Ibom State, has said. Two wombs of same mother? How did it happen? According to the bishop, the twins who will turn five this August and in November this year respectively are doing very well. He disclosed that the two kids are in the same class at George Umoh International School, Utu Abak. He said that Emmanuel Jnr has shown a lot of strength at his age as he is a young commander in the Junior Boy’s Brigade while his sister, Erikan is the lady of the house on her own. 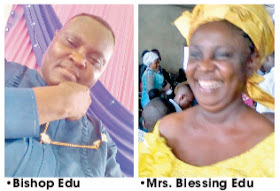 Sun News encountered the Bishop who is a native of Akwa Ibom State, and his wife Mrs. Blessing EmmanuelEdu who hails from Abia state at the Bishop’s Court. “Strangely and unexpectedly, my wife Mrs Blessing Emmanuel Edu, delivered two babies three months apart. But let her tell the story because she is in a better position to do that,” the bishop said. Hear Mrs Edu: “It is a great miracle from God because my husband and I were not expecting that, but it pleased God to bless us this way. “As this wide entrance of the church headquarters welcomes multitudes of worshippers, so also did the entrance into the Bishops Court welcomed known and unknown guests when the extraordinary news flew into town. “My case could be likened to the biblical quotes in Joel 2:25-26 that says… ‘what the cankerworm and caterpillar have eaten, when God wants to replenish, he replenishes in a thousand fold. “After our wedding in 1996, we believed and expected to carry our own children which never came for the first 10 years. At a stage, we developed thick skin and put everything about child-bearing behind us. We chose to be happy within ourselves and that was the attitude we put up just before the first miracle happened. When I became pregnant, we doubted it, but getting to the hospital it was positively confirmed. That was how our first baby girl came and we named her ‘Ekemini’ (At the fullness of God’s time). “After that experience, we waited again for another six years before our miraculous babies came in 2013. What is the miracle behind their birth? “It is absolutely the hand work of God. Although during the antenatal clinics, the doctor had told us that I was carrying two babies and the ultra-sound result confirmed it too, but we did not believe them because there have been cases where scan tests and the final results would not agree. My husband who is a miracle preacher and believer almost doubted all the results based on our experience during my first pregnancy. My stomach was very big and protruded. So, we simply assumed this pregnancy has taken the pattern of the first one and, therefore, discarded all that the scan and doctors said. From your type of deliveries, does it mean you have two wombs? Yes, I have two wombs. One is by my right hand while the second one is by my lower abdomen. At what point did you discover that you have two wombs because the first baby came alone? Well, when I gave birth to my first daughter, nothing like this happened to me, but with this second pregnancy, that is what I saw. How did you deliver the babies? In Port Harcourt where I joined my mother for assistance, when I started having contractions, I was driven to a private hospital and within hours, I had a normal delivery, not caesarean section. While still in my mother’s care, she was pressing me with hot water, urging me to sit on sanitized hot water and eat special hot nursing mother dishes (mmiriogwu); but those healing processes did not go down well with me. The moment I sit in salt water, I would feel the limp of the baby inside me. If I eat the hot pepper food, my stomach would lift up and I would be uncomfortable. We went to the hospital again and I was asked to stop all hot therapies and edibles. It was on November 20th morning, I started contracting, and the pains increased gradually. My husband drove me to a private hospital in Eket here in Akwa Ibom State and I delivered a baby boy. Within days, his body started peeling and it was attributed to the hot food I ate earlier. Based on your belief as Christians, was there any premonition or dream or prophecy to this effect? When I conceived this pregnancy, I started bleeding at the third month, which I reported to my husband, he led the prayer group that prayed and the bleeding stopped. I went to the hospital and the doctor confirmed there were two babies in me. I remembered then that if I lie down with the right side of my stomach, I would feel pains of the baby, if I lie with the left side of my stomach, I would feel the same way too. That was what made me to believe that it was during that bleeding if we must go by what some other men of God prophesied. Sometime in 2012, we had a church programme and prophecies came from different men of God saying that God would do a very wonderful thing that people would not believe in my life. I did not know it would come this way because this is God’s divine visitation. When the babies came in various months; they also came with different placentas. My doctor called it ‘an unusual miracle'. It is a strange thing because we were not taking any form of contraceptive or running up and down in search of babies. There is no lineage or trace of twins in our various families. But since we believed God for the first 10 years of our marriage, we even made up our mind to live with or without babies, so when our first baby Ekemini came, we were still satisfied and God crowned our blessing with Erikan and Emmanuel. Of a truth, we have seen divine visitation upon this home. Even we, who are the parents of the children, could not believe it until it happened. Are you expecting another miracle like this one? Well, I cannot say because we might think we have ended, but that might not be God’s plan for us, so I cannot say. What are the experience and challenges you went through while carrying two babies that were delivered differently? When the hand of God is in anything, it goes smoothly. In the days of those pregnancies, my Blood Pressure (BP) was very high. It was 230/130. I cannot say because when I had my first daughter, I did not experience such a challenge, but with the twins, that was also what I saw, but God delivered me. Another consultant Gynaecologist at General Hospital (Randle) Surulere, Dr Adeleke Kaka said that it is possible for a woman to have two wombs though not a common experience. He pointed out that in the case of the Edus, the chances are slim to be proved. “The said woman who had two wombs and delivered three months apart means she has two necks (cervix) and two cavities to each of the wombs for her to have delivered three months apart,” he said. He also agreed that the tubes to the womb could be opened in the right womb while the woman could also release ovaries from the other womb. But in such cases, he said that one womb is usually bigger and would not be of the same calibre. “But what has been documented medically is a baby can come first while the other follows suit within days and weeks not months. Even before such happens, a whole lot of precautions would be taken for safety reasons,” he said.